With a fascinating business model, the owner-operated company Spiegel Thomas has redefined the production and delivery of high-quality interior glass. 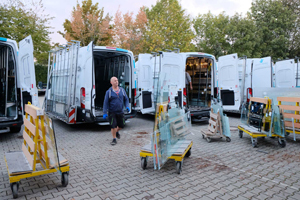 This Munich glass processor delivers any sheet ordered anywhere in Bavaria within twenty-four hours and TG sheets within forty-eight hours. Early on, Spiegel Thomas recognized increasing customer requirements with respect to delivery, committed service and the best quality, and the company oriented itself consistently accordingly. Sixty well-trained employees and state-of-the-art CNC machines controlled by intelligent A+W software ensure the best performance and extremely short throughput times in production. “Dynamic production and top quality,” explained Managing Director Maximilian Rössler, “are only possible with a committed team and the highest degree of automation.” Therefore, at Spiegel Thomas, the critical requirements for Industry 4.0 production have already been implemented. The basis for high-quality, quick processings at Spiegel Thomas are the networked CNC processing centres. 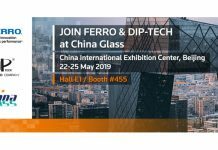 In addition to the Forvet Chiara processing line with integrated waterjet cutting, the machine park includes several Forvet CNC drilling and milling machines, as well as two Intermac Master Edge CNC processing centres. Anything that cannot be ground on the CNC machines because it’s too thin is produced on two single-sided grinding machines. Around the clock, two TG furnaces ensure that there is always enough tempering capacity available. In 2001 Spiegel Thomas selected A+W-Software in order to increase productivity in order entry and today A+W software is used across the company to ensure efficient production organization. Spiegel Thomas produces almost exclusively a batch size of one. If the CNC machines had to be programmed manually for each sheet, the company would not be able to achieve its production volume and its business model would not be feasible. For automatic activation of the machines, Spiegel Thomas relies on the A+W interface A+W CAM-DXF, which in addition to geometric data for the sheets also delivers machine-related information about tools, suction cup positioning, etc. The CAM-DXF files are generated in the A+W CAD Designer, a CAD system custom-tailored for flat glass. Of course sheet information provided by the customer can also be imported there and templates digitized. The transfer to the machine is done directly using the A+W Production Terminal software, which also provides visualization and sheet tracking. You could search in vain for production papers in production at Spiegel Thomas: the bar code label generated in work preparation includes all critical production information. The machine operator scans the sheet label at the intake of the CNC machine and then sees all technical data for the sheet on the A+W Production Monitor. This includes dimensions, processings to be done, tools, etc. If everything looks right, he initiates processing with a mouse-click. 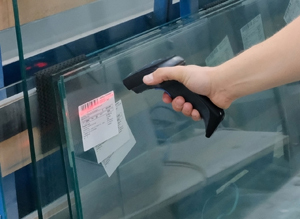 When all processings are complete, the sheet is marked “finished” in the production database with another barcode reading at the machine outlet. Thus, the new sheet status is reported to all production points, and also to the upstream A+W Business ERP system. This, in turn, creates great transparency and process reliability: no glass is lost or produced twice. In order processing, employees can provide customers with reliable information about the processing status of a sheet at any time. 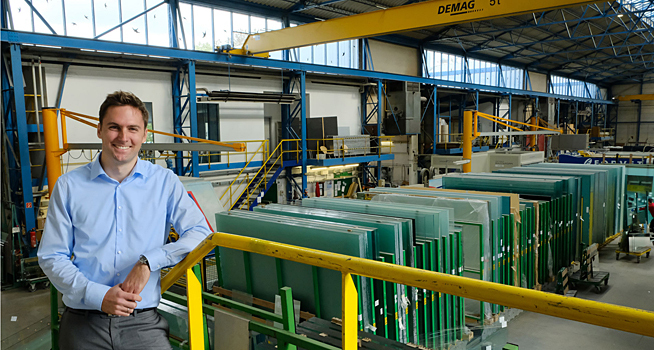 Spiegel Thomas’ main customers are trade operations such as glazing shops, carpenter’s workshops, interior outfitters and metalworkers – not to mention large customers such as equipment suppliers and office furniture manufacturers. For the team around Managing Director Maximilian Rössler, the crucial point for high-tech orientation is especially service. On request, customers receive detailed technical advising before production; if necessary, product configuration is also provided. And delivery does not end at the curb. It’s precisely smaller tradespeople who appreciate it when drivers help take the glass into the workshop or to the right place on the construction site. At Spiegel Thomas, this is part of the service. The customer is a partner and is treated with respect. Spiegel Thomas delivers its high-quality products exclusively with Sprinters. The delivery batches are small and frequently consist of just one sheet. 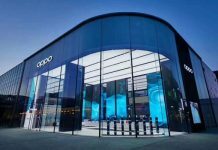 “Many of our customers, especially in the Munich metropolitan area, could not be served at all with trucks. The Sprinter fleet makes the delivery process dynamic and flexible,” explained Maximilian Rössler. With its software and system technology, Spiegel Thomas is extremely well-positioned for the future. Nevertheless, Maximilian Rössler is working with his team to make processes at the company more dynamic and adapt them to customers’ constantly increasing requirements. Current topics are ordering via Webshop and the software-controlled optimization of logistics. Here, Maximilian Rössler sees further room for improvement of efficiency, reduction of costs, and constant improvement of the company’s already excellent service. For more information about A+W: www.a-w.com.